Are you too guilty of doing these top 4 commonly made mistakes with mass gainers? Find out now. Getting that tub of mass gainer home will not guarantee you bigger muscles. You also need to know how to use a mass gainer for best results and avoid the commonly made mistakes to get quick results from a mass gainer protein shake. A word that holds a promise for a hard gainer (someone who finds it difficult to pack muscle, due to his fast metabolism) certainly offers an easier route to increase your calorie intake, along with premium nutrition. However, they are far from magic. To put it simply, mass gainers contain a heavy dose of complex carbs and proteins in 3:1 ratio and they have other nutrients (medium chain triglycerides, vitamins, and minerals) as well. 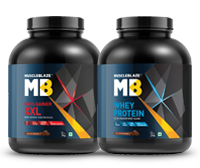 Each serving delivers a good deal of calories along with these nutrients for bodybuilding aspirants. Recruit mass gainers for bodybuilding, but do not expect them to act as miracle supplements. They are going to work only if you are committed enough towards your nutrition and are willing enough to push your limits while you work out. Even the best mass gainer supplement will not give you unadulterated muscle mass, if you are not taking the supplement in the right way. In addition to rigorous workouts and nutritious meals, you need to know how to use mass gainers for best results. This involves avoiding top 4 commonly committed mistakes. It is impossible to gain muscles without an increase in your body weight. Here lies the challenge, whether those extra kilos are muscle or fat? Since your goal is to gain muscles and keep fat at a minimum your calorie surplus should not exceed 500-600 on your training days. A lesser number will sabotage your goal of muscle gain if you go for any extra unplanned activity (shopping at a supermart or a game of football). On your non-training days, you should stick to your maintenance calories. If your maintenance calorie needs are 3000, then the days you train, your calorie allowance will go up to 3500. Naturally, all this talk on calorie surplus hovers around high-quality nutrition. Sitting on the couch and gorging on hamburgers the whole day will not build muscles, rather unsightly flab and love handles. As a muscle seeker are you are eating the right foods, like complex carbs, such as potatoes, brown rice, oats and pasta to get sustained energy. Fruits also provide healthy carbs, along with antioxidants, required to overcome the stress of training. Going low-carb will defeat your plan. Similarly, shying away from fats is not the right strategy, because saturated fat keeps your testosterone levels high (much needed for those muscle gains). Most importantly, you have to follow the rule book (1 to 1.5g for a pound, 453g of body weight) on your protein needs, because muscles are made of proteins and if you shortchange on the necessary amino acids, your muscle growth suffers. 3. ARE YOU MAKING THESE ERRORS WHILE USING MASS GAINERS? Well, mass gainers provide a foolproof way to meet your calorie needs. It can't be simpler than mixing the powder with milk or water (milk is preferred because it contains proteins and will add calories, especially for people with a fast metabolism) in a shaker or blender and then gulping it down. Your tub of mass gainer comes with a usage direction. Follow the manufacturer's recommendation when it comes to the scoop size and do not use less than it to make it last longer. You should take mass gainers on your off days, as it helps meet your nutritional goals of the day. You need to adjust your daily caloric target, but it should not come at the expense of your mass gainer, as it provides you a mix of right nutrients. If you wish to get the best results from a mass gainer you should use the complete serving in a day with added foods for your protein needs. The general mistake beginners do is to not take the full serving of a mass gainer and consume it like whey protein, so that it lasts longer. Mass gainers and whey protein are not alike! Know the difference. Whey protein is derived primarily from whey isolate and whey concentrate. Mass Gainers contain a mix of proteins, which include both slow and fast acting proteins, like whey and casein. Whey protein is lean on calories. Mass gainers serve calories almost thrice of whey proteins. Whey acts quickly, therefore it is best suited as a recovery protein shake, post workout. The whole objective of mass gainers is to put the user in a calorie surplus situation so that he is able to grow the size and strength of his muscles. Read the label carefully, while choosing a mass gainer. Look for ingredients like digestive enzymes, offered by MuscleBlaze Mass Gainer XXL, so that you can absorb the premium nutrients and make the most of it. If you have been bodybuilding for a while, your mass gainer should include the strength of creapure, the purest Creatine from Germany, to add more power to your lifts. 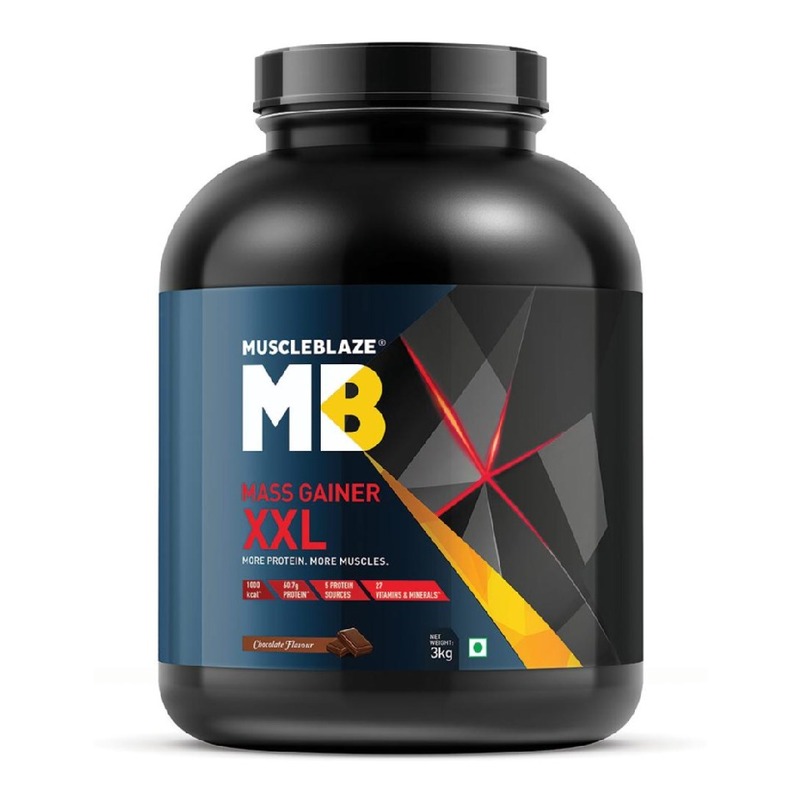 Mass Gainer Pro from MuscleBlaze is just the right mass gainer for such bodybuilders. Weight gainers are best mass gainers for beginners. 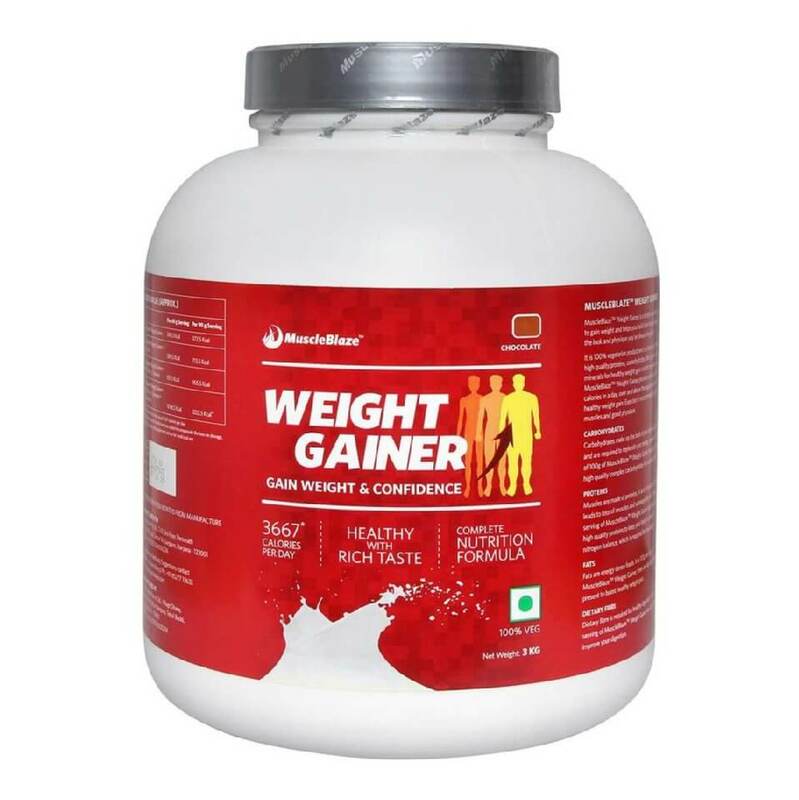 Offering protein and carbs in 1:5 ratios weight gainer is more focused towards filling in the calorie deficit and is the best mass gainer for people with super-fast metabolism. When to drink mass gainers? Drink your mass gainer as directed by your trainer/nutritionist or follow the manufacturer's instruction. Since mass gainers contain ample dose of complex carbs, you can have it post workout to get that insulin surge required for building muscles. You can also begin your day with a mass gainer at breakfast to gain good calories. Also take a small amount of it before sleeping, or in-between meals. For a muscle to undergo hypertrophy, you need to provide it enough stress by doing something unfamiliar. Until muscle tissues suffer wear and tear, they will not repair themselves. 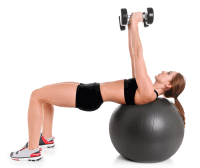 Your workout plan should be such that it should optimise muscle tension. Stick to 6-12 rep range to generate adequate muscle tension. Doing one set of an exercise will not serve as an adequate stimulus. Do multiple sets to maximise tension, and muscle damage. Keep your rest time between 60-90 seconds. Hit the muscle from all directions. For example, you need to alternate between decline bench, flat bench, and incline bench to target different areas of your pectoral muscles. Lift something heavy and perform 1-5 reps at least once a week to maximise the release of Human Growth Hormone. Keep a workout log to track your progress. Rest properly because your muscles repair themselves while you are asleep. Your quest for mass is also a quest for knowledge. Find more about new information on nutrition and workout techniques and be patient with your progress. Rome was not built in a day! Between lifting iron and drinking protein shakes exist 6 diet rules for bodybuilding, a must know for all smart muscle seekers. If you want to squat like a pro, all you need is a good sense of balance, flexible hips, ankles and shoulders. Learn more. Testosterone, the primary male hormone has the potential to maximize muscle gains. Read more about top 12 evidence-based tips to boost testosterone naturally.